The domain of Earth and Planetary Sciences includes the solid Earth and its hydrosphere and extends to the neighbouring terrestrial planets. It is a multidisciplinary field in which the principles of chemistry, physics, and mathematics are applied to the rich problems of the real world in order to understand how planets like the Earth work; in the past, the present, and the future. Career opportunities are many and varied for graduates in the Earth and Planetary Sciences. There is presently a demand for graduates with expertise in many disciplines of the Earth Sciences. Our students are recruited for employment in the petroleum and mining industries, and in the environmental sector. During the summer months, undergraduate students are generally able to obtain employment from industry or government agencies, providing them with both financial benefits and first-hand geoscientific experience. Career opportunities in planetary science are present in universities and research organizations. Classes are relatively small, resulting in an informal and friendly atmosphere, with most faculty and students interacting on a first-name basis. Emphasis is placed equally on quality teaching and research, providing undergraduate students with a rich and exciting environment in which to explore and learn. 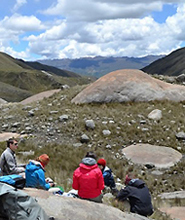 The Earth System Science major draws on disciplines ranging from ecology and geography to geology, meteorology, oceanography and more. Questions? Contact Student Affairs Coordinator Kristy Thornton or Director of Undergraduate Studies Prof Jeanne Paquette.